With features on Forbes and The New York Times, fashion entrepreneurs Erica Cerulo and Claire Mazur affectionately proclaim their support for what they believe to be the sweet intersection of female friendship and business in their new book “Work Wife.” As co-founders of design and e-commerce website Of a Kind, Cerulo and Mazur’s experiences inevitably drive the majority of the instruction and advice the book offers about attaining and maintaining this “work wife” relationship. To supplement their own musings, the two women also draw upon the stories of several other successful “work wives” from KMR Law Group’s Keli L. Knight, Yondi K. Morris-Andrews, and Jessica B. Reddick to lingerie brand Hanky Panky’s Gale Epstein and Lida Orzeck. With tips on “dating around” to find the perfect wife and handling money as women, Cerulo and Mazur attempt to present a practical how-to for business besties. 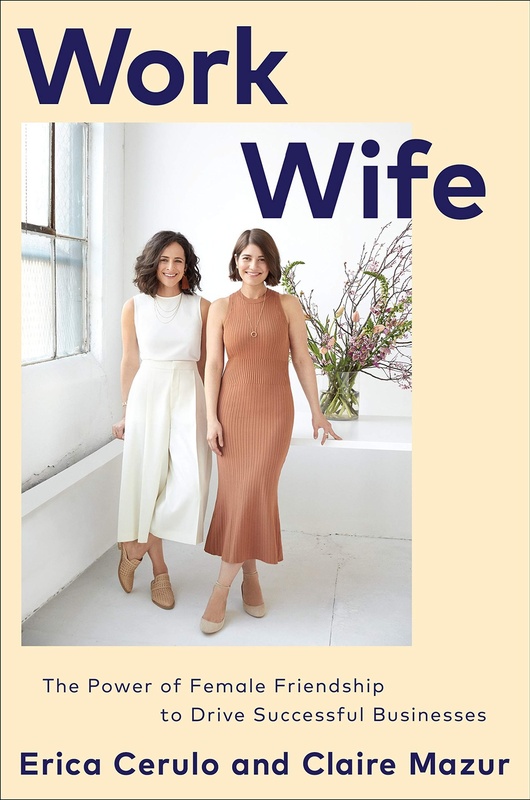 Although the book may not be entirely useful in this particular department, however, it presents an unexpected value in a comparably meaningful way: Erica Cerulo and Claire Mazur’s “Work Wife” offers better wellness and relationship advice than most “Cosmopolitan” articles and Barnes & Noble self-help books. Derived from the dated, heteronormative, and sometimes inappropriate “office wife” relationship of a man and his “high-functioning secretary,” Cerulo and Mazur define their “work wife” dynamic as a “a combination of personal and professional bondedness and healthy, supportive closeness among women.” Despite effectively selling the reader on the magic of this work wife relationship, Cerulo and Mazur provide underwhelming advice on how to actually achieve a relationship as strong and powerful as theirs. The introduction claims that from the start of their professional pursuits, Cerulo and Mazur “saw each other as equals; there was no power dynamic to contend with, and [they] trusted that would remain constant.” However, for the majority of women who have been painfully socialized to internalize misogynistic values and involuntarily compete with one another, Cerulo and Mazur’s perfectly balanced personal and professional relationship sans any jealousy or resentment about power offers little to the average female reader. Ultimately, the Of a Kind co-founders, along with all of other “thriving” work wives whose stories they include, tease us with the splendor of having a work wife but fail to properly address the barriers of getting there. While their advice on work friendships may not be groundbreaking, Cerulo and Mazur have innocuously interwoven a refreshing and grounded approach to health and wellbeing in the workplace throughout their work wiving guide. In their “Finding Work-Wife Balance” section, the book very importantly discusses the difficulty and danger of pursuing a perfectly compartmentalized personal-professional life: “The real win has been not having to bury the baggage of our nonoffice lives.” By encouraging a work-wife relationship built on openness and communication, “Work Wife” gives us meaningful tools to healthily maneuver any office relationship — not just the one with our business best friend. In further discussing the benefits of developing a nourishing professional relationship, they explain, “we get more practice at expressing our feelings and being vulnerable than the majority of people do in their work day to day.” Though we may like to believe that properly communicating one’s feelings is a matter only relevant to five-year-olds locking themselves in their rooms, healthy self-expression is clearly an issue that persists throughout one’s life when a surprising number of adults throw similarly-sized tantrums. In an incredibly mature and insightful way, Cerulo and Mazur acknowledge the necessity of recognizing our feelings at work in order to better understand how to manage relationships in all aspects of life. Though we may not have a comprehensive guide to overcoming internalized misogyny in the workforce and becoming badass female co-entrepreneurs as the book attempts to do, Cerulo and Mazur perhaps intentionally contribute something of similar value: In a world which adamantly condemns discussing anything personal or expressing in the workplace as unprofessional, “Work Wife’s” healthy reimaginings of work life are entirely necessary.